One of the treasures, and indeed a surprise to many who enter the church, is the stunning apse painting. In 1987, discussions started on a new work of art for the apse at St Augustine’s. It was to be funded by several members of the Done family, in memory of Winifred Done, a much-loved congregation member, who died in March of that year. A young artist seeking work, Fleur Channer, had approached the clergy, and was commissioned to prepare sketches for a painting in Early Christian style, similar to that which St Augustine might have seen in Rome, before Pope Gregory the Great sent him to England to convert the heathen Anglo Saxons. Adaption’s to the sketches followed and when the final drawings were approved, the figures were of a later period than originally intended, showing the influence of Italian, Greek and Venetian artwork. The central figure is of a turquoise robed seated Christ, his right arm raised in blessing. The three touching fingers on his right hand indicate the Holy Trinity. In his left hand, he is holding the book of words, the Gospel. His holy state is symbolised by his halo. In his halo, there are three groups of dots in a cross formation in red. This again represents the Holy Trinity, also the fact that he died a painful death on the cross and the belief that this was to save us all. He is flanked on the left by a tall Virgin Mother with child, and on the right by an elderly St Augustine, who is wearing the pallium (a creamy/white stole with three gold crosses), the badge of office given by a Pope to his Archbishops abroad. Because of the uncertainty of the composition of the plasterwork of the apse, Fleur decided to paint in egg tempera, i.e. powdered pigments mixed with egg yolks and a little water. Luckily she had a good head for heights as she worked high up on scaffolding. She had to work in an orderly fashion, mixing her pigments as she went along, sending out periodically for more eggs! The curve of the apse meant that modifications to her painting had to be made as she worked, the foreshortening of the figures posing minor problems. The original painting of St Augustine, now lost to posterity, was that of a younger man with a kind, distinctly Greek face. Onlookers came into church one day and were shocked to find that Fleur, dissatisfied with her work when she descended the scaffolding, had painted him out completely. The older St Augustine who quickly replaced him has receding white hair, a white beard and a sombre face and was more in keeping with the figures of Christ Pantocrator (the All-ruler) and the Virgin. Close inspection of the feet of Christ show that his big toe is shortened, in keeping with art of the period. Fleur spent many days painting the beautiful border of apples and leaves around the apse. It was copied from mosaics in the mausoleum of St Constanza in Rome. It is a pity that their full beauty cannot be appreciated from floor level. The crowing glory of this magnificent work of art is the two types of gold leaf (rouge gold and yellow gold in 2 inch squares) painstakingly applied to the background by Fleur and her helper, Barbette Saunders over several days. The subjects of the painting are completely surrounded and permeated with light; the rays from the inner divine source of light. There is no external light source in this painting and there are consequently no shadows. 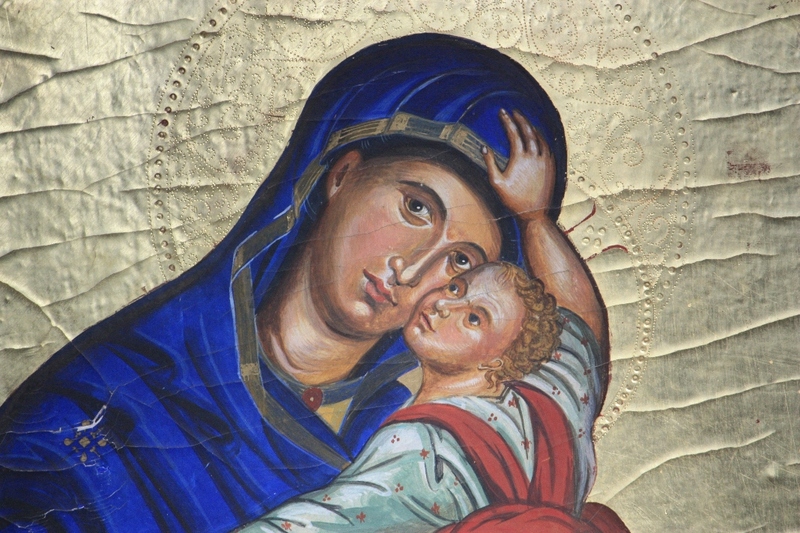 Orthodox iconography is not meant to be realistic. It is schematic and stylised and has it own set of rules, which are adhered to by icon painters like Fleur. It expresses inner, spiritual qualities which radiate from the whole person. It is no illusion of the physical, visible world, but a vision of the spiritual, invisible world. 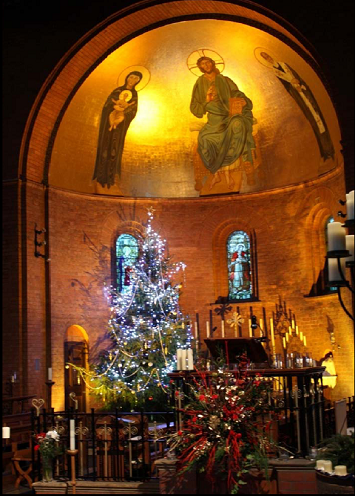 The Apse painting was blessed on 26th November 1989 by Bishop Peter of Malmesbury. In 1993/1994, inspired by the success of the Apse painting, Rev Christopher Dobb and Rev David Woodhouse once again commissioned Fleur, who had remarried and was now Fleur Kelly, to create two large wooden icons which would be sited on either side of the Apse. 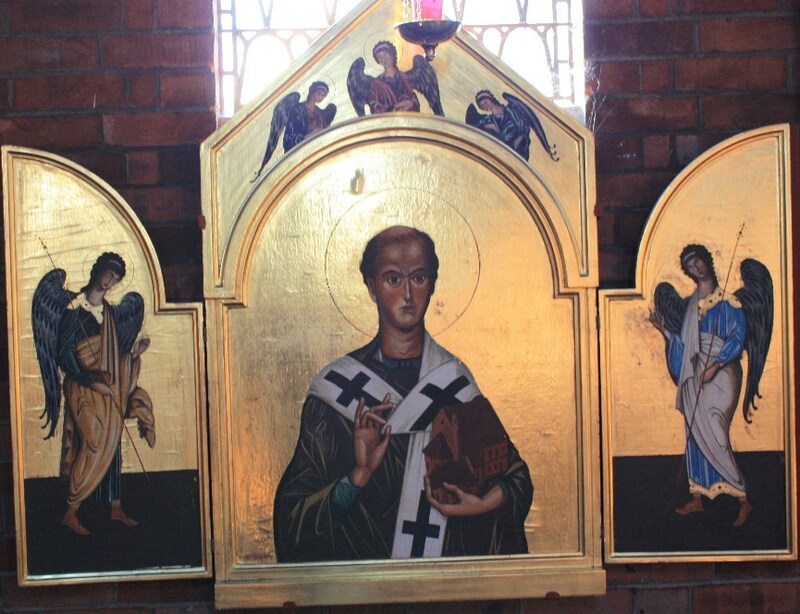 Money for the first icon was donated by the two priests to celebrate their twenty years in Holy Orders. A seated Pope Gregory, working at his desk, with a dove on his shoulder representing the Holy Spirit, was painted on specially treated canvas attached to an arch-shaped wooden panel, painted in egg tempera in a similar style to the Apse painting. This was to be sited on the wall near the organ, which meant that the foundation stone plaque had to be re-sited. Donations from the congregation were sought for the second complementary icon, a portrait of Anglo Saxon King Ethelbert of Kent. His wife, Queen Bertha was already a practising Christian. She persuaded her husband to allow Augustine and his followers to land in Kent. The King and many of his subjects were converted to Christianity and the King gave Augustine land at Canterbury, where he established his See. Thanks to the generosity of congregation members, it was not long before the paintings were executed and in situ. 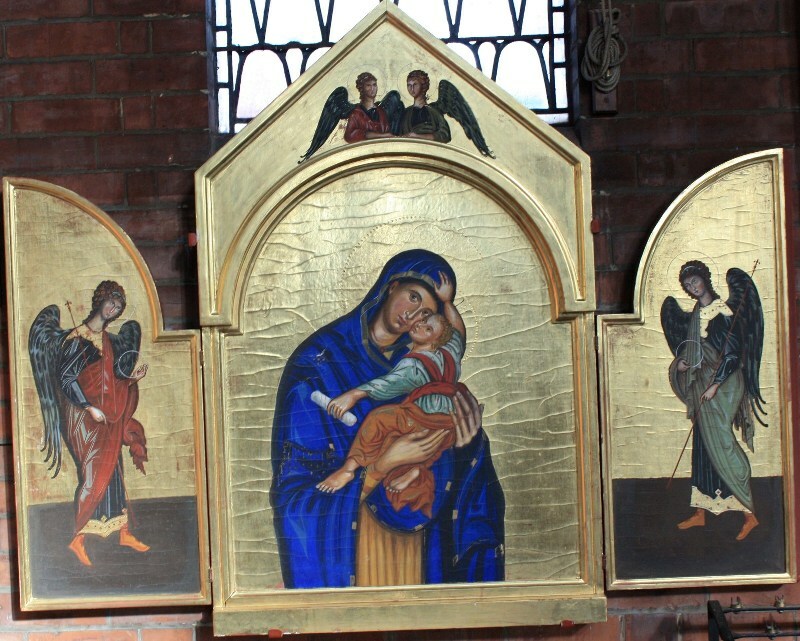 Two wooden triptychs by Fleur Kelly, now in place on the north and south walls of the church were also commissioned. These were funded by donations from the congregation and installed in late 1997, and dedication on 25th January 1988.